Levi enjoys employing his imagination out-of-doors ~ making large nests out of hay, constructing a bow with stick and twine, and digging up fossils ~ but when his cousin, Ilex, arrives.... Well, the imagination is exponential. She directs plays, assigns kingdoms, builds miniature characters out of pine cones, sets up 'villages' in a large clearing under a grove of pine trees (think Roxaboxen), and the list is endless. I am exceedingly grateful for the friendship between my son and my 13 year old niece. They are surprisingly two peas in a pod, and Ilex is an excellent activity director when she is with the boys. I've shared her poetry before, but I hadn't ever posted photos of her nature creations or sketches. So, today is the day. Inspired by a book about fairy houses, Ilex whipped up this little abode. My favorite part: the nutshell bowls filled with single blackberries. 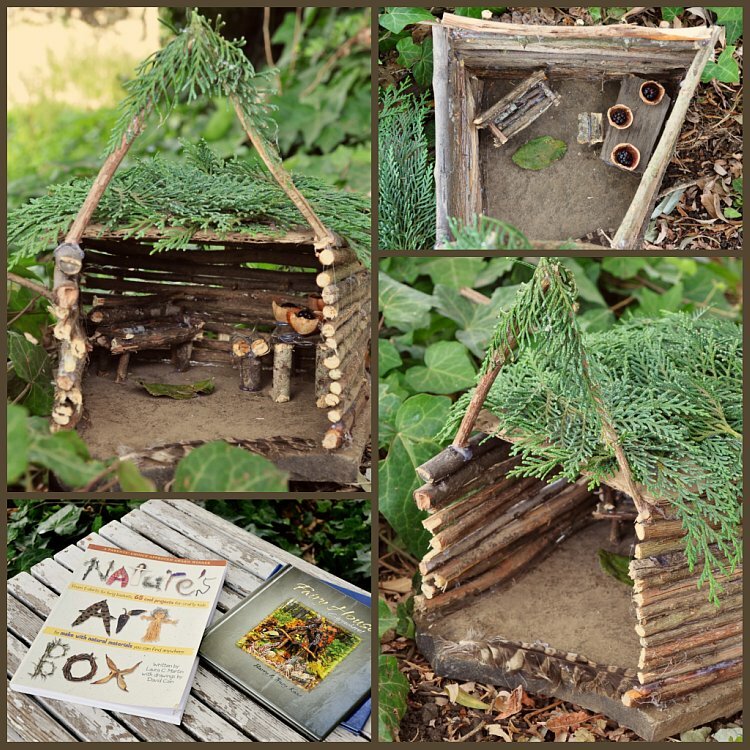 Nature's Art Box is a wonderful book full of nature craft ideas and instructions. 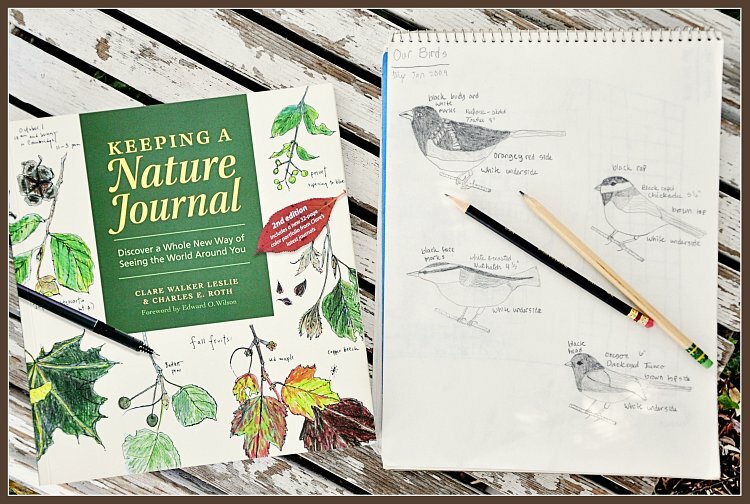 Keeping a Nature Journal is a gorgeous book of sketches (some color, some black and white), ideas, and instructions for keeping one's own nature journal. I could peruse this book for hours. I'll be getting a copy for Levi (and myself) in the next year or two, so we can begin our own nature journals. That girl has talent coming out her ears!! My girls loved, loved, loved that book when they were young. Did you ever read Miss Rumphious by the same author? It is also very good. Also a favorite of my kids (and me too!)... Reminds me of when I was a girl and we'd build forts outside or play in the ditch next to the railroads (danger danger) building houses and doing a lot of pretending. 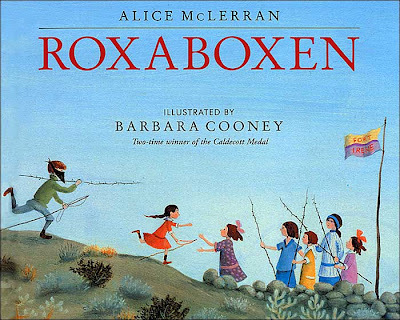 I had forgotten Roxaboxen! We'll have to check it out from the library again. Thanks for the reminder. And, your niece! Wow, her creations are amazing! Holy cow! That little fairy house is TOO fantastic and her drawings are amazing. I am very impressed! I bought the Nature Journaling book this summer. Our goal is to sketch together twice a month, with the hopes that we all pull out our journal on our own more often. So far, we have sketched flowers. Can't wait to sketch more!